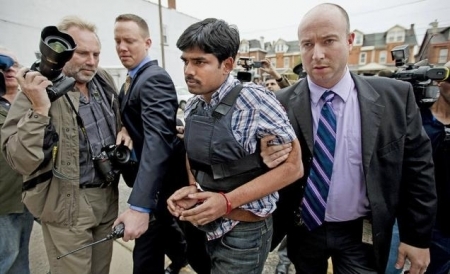 Raghunandan Yandamuri, 26, of Upper Merion, Montgomery County was ordered to be held for trial at a preliminary hearing today. On October 22, he allegedly murdered 61 year old Satayrathi Venna as she fought back Yandamuri's attempt to kidnap her 10 month old granddaughter, Saanvi Venna. He placed a handkerchief in Saavni's mouth and blanket over her head then carried her off in a suitcase. Ransom notes asking for $50,000 were placed around the apartment at the Marquis Apartments in King of Prussia. The murder and ensuing Amber Alert made international headlines. Yandamuri, who was familiar to the family, even helped out in the search and attended a vigil. The language of the ransom notes indicated that a close friend wrote them, which eventually implicated Yangamuri. He led investigators to the body of the little girl whom he had suffocated and dumped. He explained to investigators that he never meant to kill anymone, he only meant to kidnap the girl to extort a ransom from the parents whom he believed had money. The Saavni's are employed as software engineers. Yandamuri is deep in credit card and gambling debt plus has a child on the way. Yandamuri is charged with murder, kidnapping, robbery, burglary, theft and abuse of corpse. The Powerball jackpot is now a $550 million annuity or a $360.2 million cash payout. The chances of winning are the same as always, 1 in 175.7 million. If you buy every single $2 ticket it'll cost you $351 million. Of course you'll be guaranteed to win, but it's not guaranteed money. You may have to split it and then there's taxes. I also don't think Wawa can print out that many tickets. For the most up to date information: powerball.com. Last week Governor Chris Christie estimated that the damages Hurricane Sandy caused in New Jersey were $29.4 billion (see: Christie Estimates $29.4 Billion Sandy Damages) but warned that they may go up as time goes on. Well only 5 days later he's hiked the estimate up to $36.8 billion, which is more than neighboring New York. “We’re embarking on a serious and necessary path that’s going to require a great deal of federal assistance, which I will personally advocate for in addition to members of our congressional delegation,” the governor said Wednesday. Christie has placed former assistant state attorney general Mark Ferzan in charge of the state’s long-term recovery efforts and brought in Witt Associates who helped Louisiana recover from Hurricane Katrina. FEMA has already allocated $500 million in aid and 230,000 New Jersey residents have registered. Christie said that more than 30,000 homes and businesses were significantly damaged or destroyed by the storm. He's confident that the state's representatives in DC will work to maximize the assistance that New Jersey can get from the federal government to help pay for the bill.